Tomb Raider has seen a lot of change, lately, in its series. After the end of the trilogy of Anniversary, Legend, and Underworld, the developers wanted to try some different things with Tomb Raider. The first thing they tried was to put Lara Croft in a series of her own. Not a series by the name of Tomb Raider, by simple with Lara Croft’s name. That resulted in Lara Croft and the Guardian of Light. It was a different take on it, for sure, and then they completely rebooted Tomb Raider, incorporating more elements used in games like Uncharted to bring the series to be more modern. However, handhelds have missed out on the new games. Lara Croft and the Guardian of Light had an iOS version, but the new games have never reached out to handheld systems. This has not always been the case, though. Up until Tomb Raider: Underworld, there were handheld versions of Tomb Raider games. Even back in the days of the Game Boy Color, there were Tomb Raider games, though those played very differently from the Tomb Raiders we have known and loved over the years. 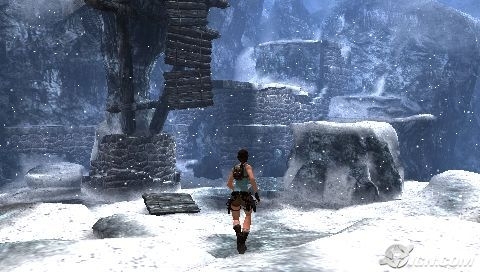 In the last generation, Tomb Raider crossed platforms onto the PSP with Tomb Raider: Legend. This “reboot” of sorts revamped what Tomb Raider was, greatly increasing the fun in the game with adding a lot of story elements as well as more user-friendly controls. However, it didn’t run well on the PSP. Later on, though, there was also a PSP version made of another game. Being a remake of the original Tomb Raider, here is our official review of Tomb Raider: Anniversary! Lara Croft has established herself as a well-known tomb raider. One day, she is approached by a man representing a wealthy businesswoman whom goes by the name of Jacqueline Natla. Natla asks Lara to find some artifacts for her. First resistance, Lara agrees when she realizes it is the Scion Artifact from the mythical land of Atlantis. Being something she and her father worked a great deal on finding, Lara sets off to Peru to begin her search. Story is relatively light in Anniversary. As opposed to Legend, which had constant radio chatter, you will be traversing your locations with mostly deaf ears to anything but gunfire, waterfalls, and wildlife. There are a few scenes in each area, and there is a lot more to the story than there was in the original Tomb Raider, the story is relatively light, leaving it as you searching for the Scion of Atlantis and Lara learning more about its origins along the way. At its base, Tomb Raider is a 3D Platformer. As you explore tombs, dungeons, valleys, and more, you will be traversing a lot of dangerous platforms and solving mind-bending puzzles to get where you need to be. It is as much as you would expect of traps and puzzles in ancient temples that you may have seen in various Hollywood films, though with more plentiful puzzles than you may be expecting. You will be in control of Lara from start to finish, and when you start up the game, you can either jump into the Story Mode or you can play Croft Manor, which is a lengthy tutorial mode, allowing you to learn the basics of the game and can be, at times, harder to figure out than the actual game, itself. Once you have the basics down, though, you can jump into the game to enjoy the story. The game is divided into several levels and go across four major area locations: Peru, Greece, Egypt, and the Final Level, which will not be mentioned because of story spoilers. Within each of these levels are sub-levels. In Peru, you will be traveling through dungeons to an ancient village, and then through The Lost Valley to open up the way to the Tomb where a piece of the Scion resides. Each area is like this. It is divided up into several dungeons, all leading to the end goal of what you are looking for. Navigating these dungeons is with a combination of combat and acrobatics. You will have to climb up walls, jump over large gaps, and traverse dangerous traps to be able to find puzzles that will lead you to your goal. Lara is very agile and can jump far. However, many ledges you may find will not support your weight. You will need to carefully look at where you’re going and plan ahead for what all you need to do in some areas to get to switches or to collect key items to traverse through the next area. The Puzzles you will find can be easy or challenging. In the first few levels, it could be as easy as finding a key in a village to use on a door, or as challenging as racing against the clock to traverse high walls and structures to move barriers away from a massive door to open the way to the next area. For the most part, puzzles are relatively simple, though you will probably need a walkthrough to avoid getting stumped at some of the end-game puzzles. The other area of the game is combat. You will be equipped with weapons as you play through the game, from the default Dual Pistols that have infinite ammo to other weapons you will pick up later on, like a Shotgun or an Uzi. These will be used not only to shoot targets for puzzles, but also enemies. 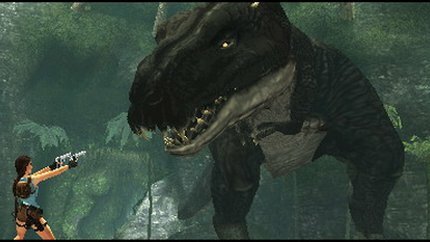 You will encounter many types of enemies in the game, all of which are wild animals. From bats to cougars to velociraptors, you will have a lot of enemies trying to keep you from reaching your goal. There will also be boss fights and cinematic scene fights throughout the game. Boss fights will involve using the Rage Meter to defeat the enemies. This happens to both bosses and normal enemies. Attack them enough and they will enter Rage Mode and charge at you. During this, you can time a jump to enter a Matrix-style slow-motion scene until you can unleash one final shot to finish them off. Cinematic Scenes are something more seen in current games, where you will be in combat in a scene and have to follow on-screen button prompts to successfully complete it. Once you beat the game, you also have access to extras that you can access if you collect hidden objects in the game, like Relics and Artifacts. This can range from cheats to enable while playing the game or artwork and videos to watch. When you beat the game, you can also unlock the Developer’s Commentary, which will play as you play the game, allowing you to hear the developers’ (the same that developed the original Tomb Raider) take on each area you go through. 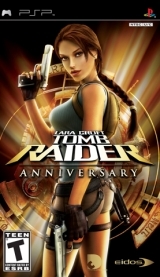 Tomb Raider: Anniversary will last you about 8-10 hours to complete. If you know what you’re doing and can do a speed run, it may only take about 8, but for beginners, I would expect to take up at least 9-10 hours, more if you aren’t using a walkthrough or guide. It’s a pretty challenging game. Controls are one thing that are plentiful in this game. This is in the fact that throughout the game, you will be using almost every button available to you. Obviously, the Right Analog Stick isn’t required and this is one PSP game, where it is not suggested you switch over the camera controls to that Right Analog. Unlike most 3D PSP games, Tomb Raider: Anniversary does a pretty decent job at setting up its controls. Moving Lara as well as aiming jumps will be done with the Left Analog Stick. The D-Pad will also be used, though it is not used for moving. The D-Pad is used for cycling through your currently-equipped weapon to switch it out with something else. That is done with the Right D-Pad Button. The Left Button will allow you to launch your grapple to grab objects with metal rings on them, and the Up Button will let you go into Manual Aiming Mode with your equipped weapon(s). The X Button will be used for jumping and launching your grappling hook when you’re in mid-air. The Square Button is used to fire your weapons, the Triangle Button interacts and picks up objects and Items, and the Circle button is used to roll and dodge away from traps and enemies. The L and R Buttons are also used, which control the camera. The L Button moves the camera to the left and the R Button moves it to the right. The L and R Button can also be held to lock onto an enemy. This is useful, but also can get frustrating. Once you lock onto an enemy, you have to keep holding down L and R to keep yourself locked onto them. It takes time to get used to this, but the biggest thing is the Rage Mode Slow-Motion Scenes. You have to hold now L and R as well as dodging and firing with precise timing for these to work, and that can be quite challenging, at times. Presentation is where this game really shines. 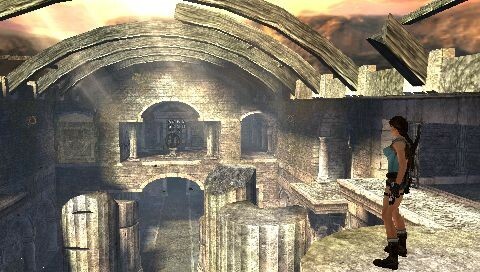 Despite being made back in 2007, Tomb Raider: Anniversary is one of the most visually pleasing games to ever grace the PSP. There are some jagged edges with character models, but there is also incredible detail that was put into the port of the PS2/PS3 game. If you zoom in on Lara, you can see how much detail, from the weaves in her shirt to dirt collecting on her cheeks. The developers did a nice job at making it visually pleasing. Smooth out the edges and it could pass as a PS Vita game. The way the game plays is also improved from Legend. While the frames do not always stay exactly the same, the frame-rate always stays steady and doesn’t lag when you’re playing the game. However, in a few sections of the game, you will see the frames shoot up and offer a 30 Frames Per Second sequence. Even if just a few times, 30 Frames Per Second is very impressive for a PSP title, let alone one in the system’s second year. The Load Times are also not too bad. When you have to load a level, the load times can take a bit of time. You will normally be waiting for about 5-7 seconds for a level to load, and a little less if you fail and have to restart. Tomb Raider: Anniversary is a very faithful remake of the original game, and one of the PSP’s best-looking 3D games. Having the same content as the PS2 and PS3 version, sporting 8-10 hours of content with the extras and the developer commentary, Tomb Raider fans cannot go wrong with this title. It looks great, it plays great, and it offers a challenge, even to those who have played the game before. 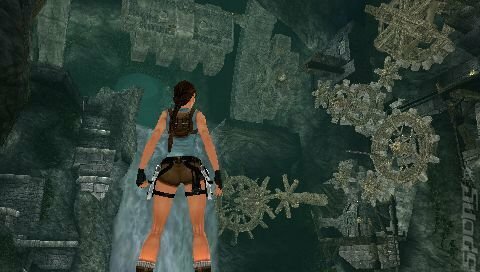 The PlayStation Vita Review Network Rates Tomb Raider: Anniversary a 9/10.